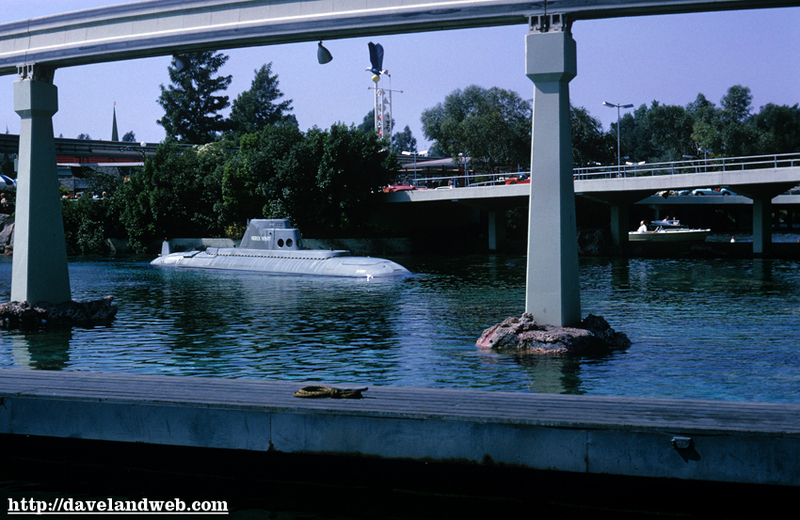 It’s been 12 years since the PeopleMover chugged along its Tomorrowland tracks, and it still manages to generate a number of rumors about its return. 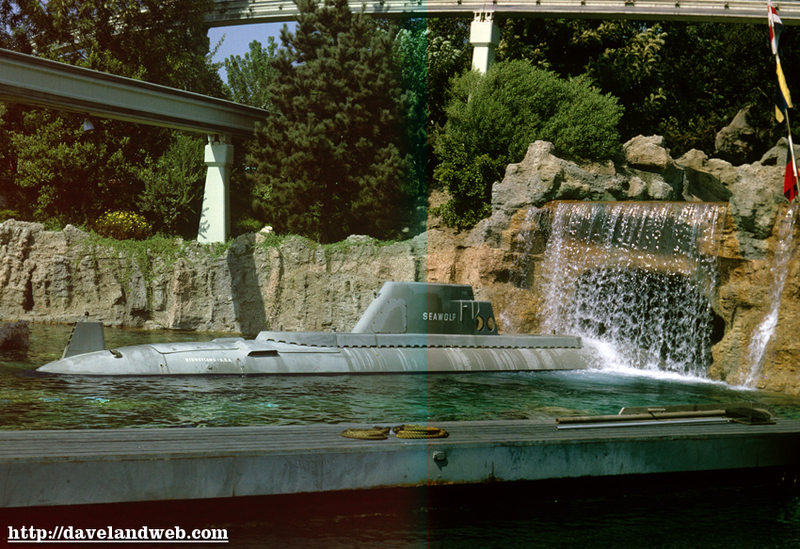 These 2 views are from September 1967. 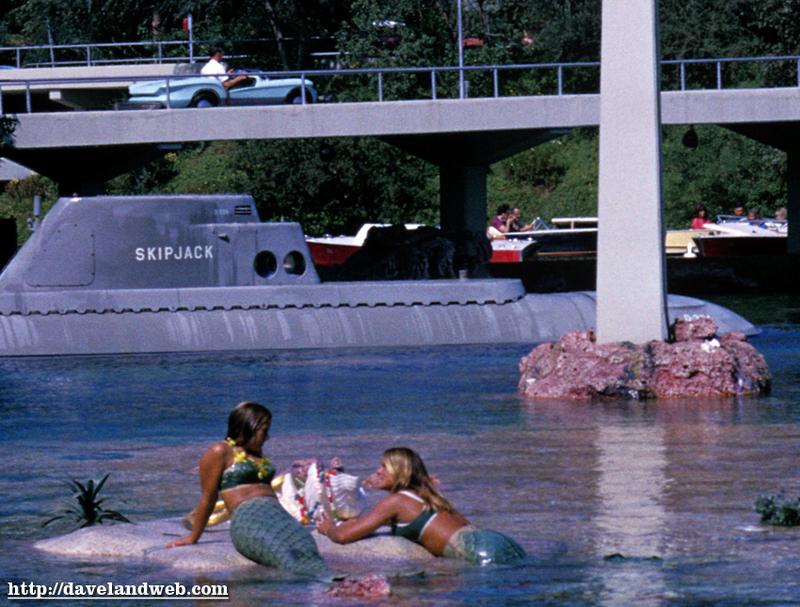 Walt had high hopes for this “attraction,” as it was to be one of the cornerstones for EPCOT. 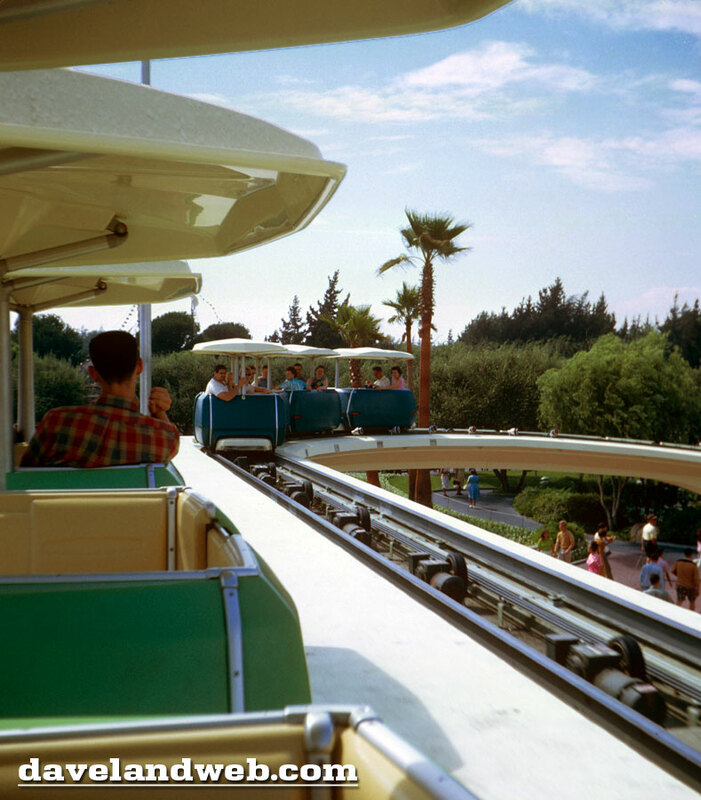 The Peoplemover was to be one of the main forms of transportation that would take people from the city into their suburban homes, thus practically eliminating the need for cars. 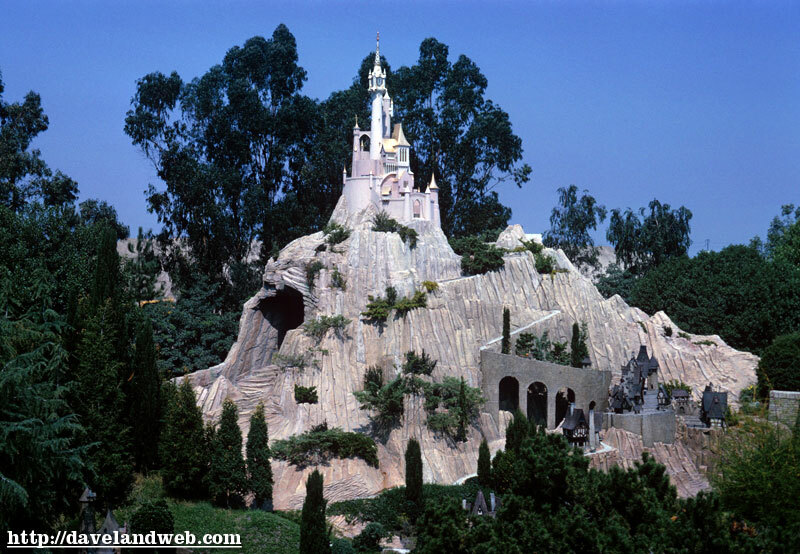 It’s easy to see why many lament Disney’s passing, as there were so many more things he wanted to achieve. 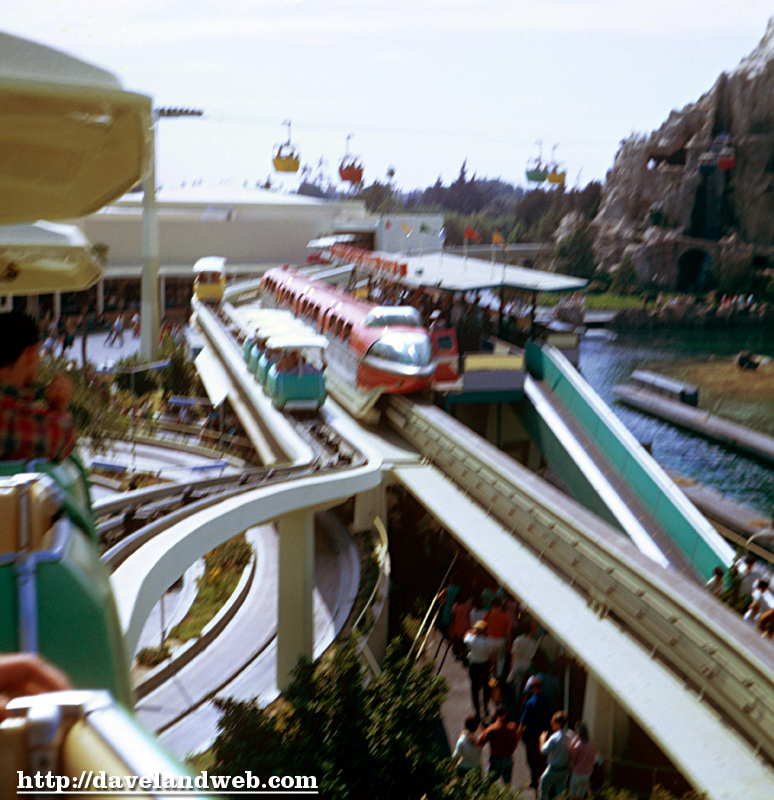 Even though this one is blurry, I am including it as it shows a nice view of the Peoplemover and the Monorail together. 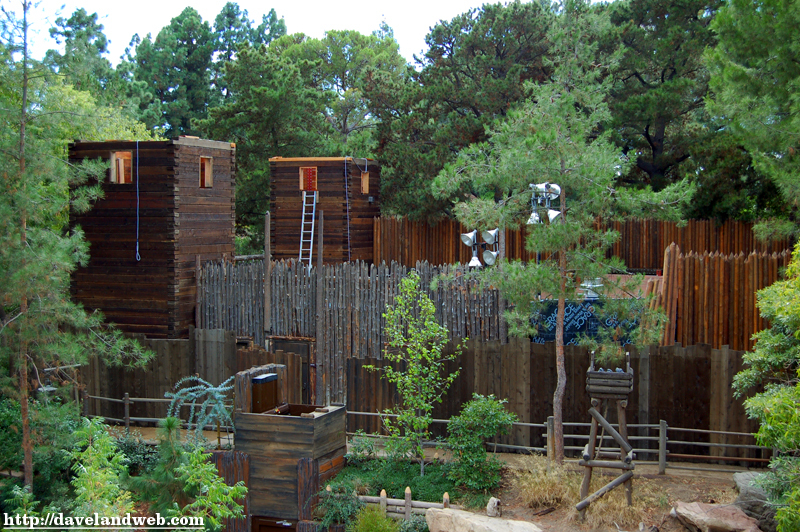 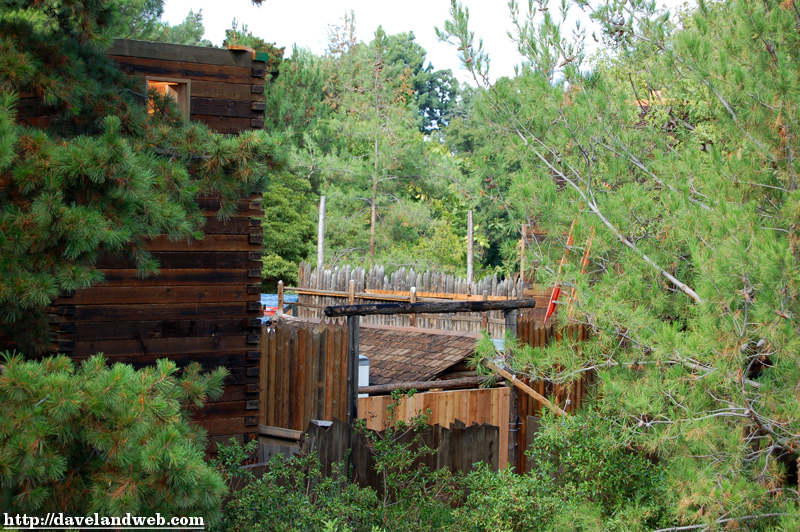 One of my favorite aspects of Disneyland is how multiple attractions are “woven” together in certain areas. 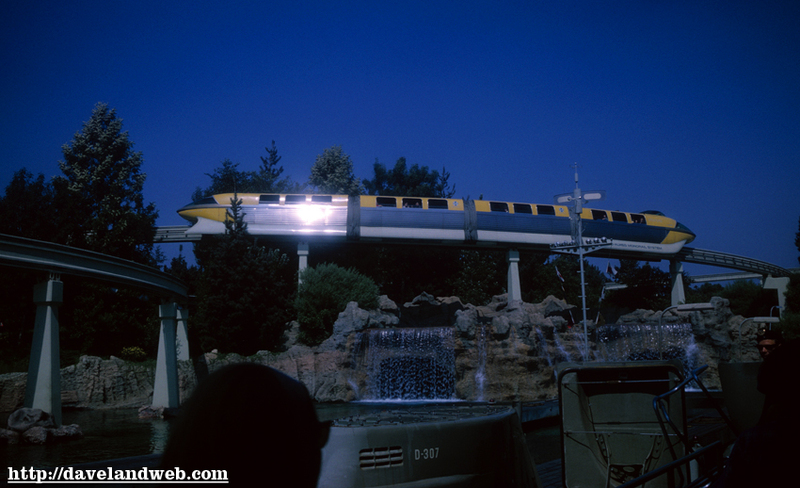 See more vintage PeopleMover photos on my main website. 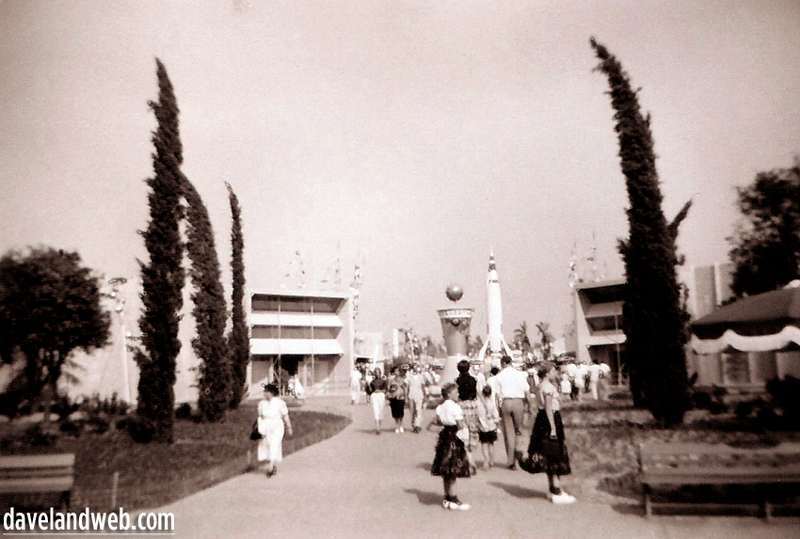 CoxPilot has gone to great lengths to scan these rare images that he shot personally in July 1955. 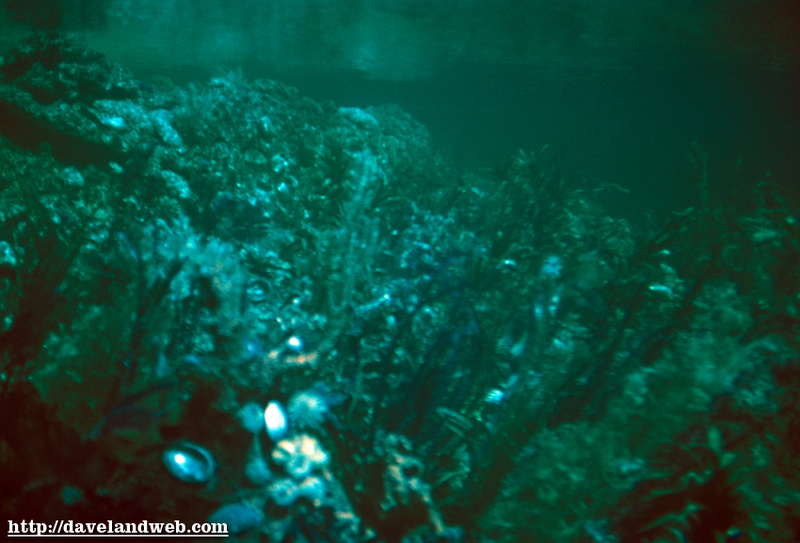 Although some are a little blurry, their rarity and subject matter more than make up for it. 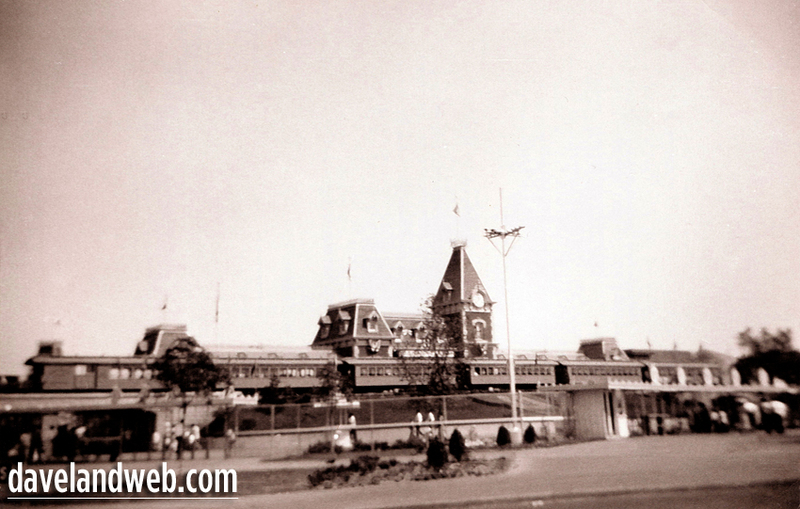 First is an image of the Ticket Area, showing Passenger Cars at the Main Street Train Station. 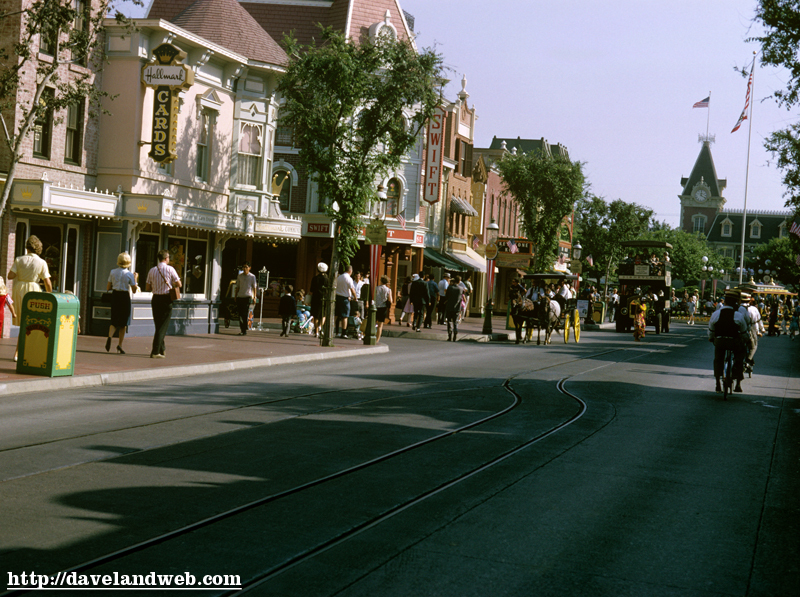 Moving into the park in Town Square, we have a nice shot of Main Street, taken from the steps of the MS Train Station. 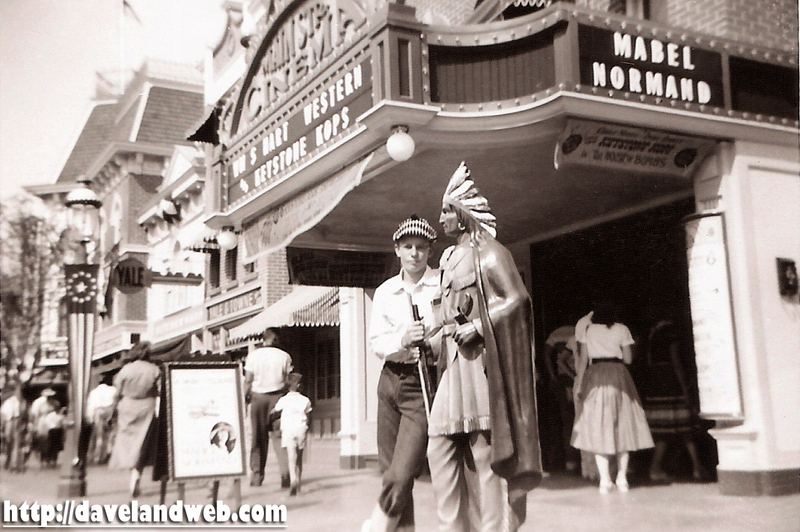 Here’s one of CoxPilot, in front of the MS Cinema, back when they used to show silent movies (Mabel Normand’s in this photo). 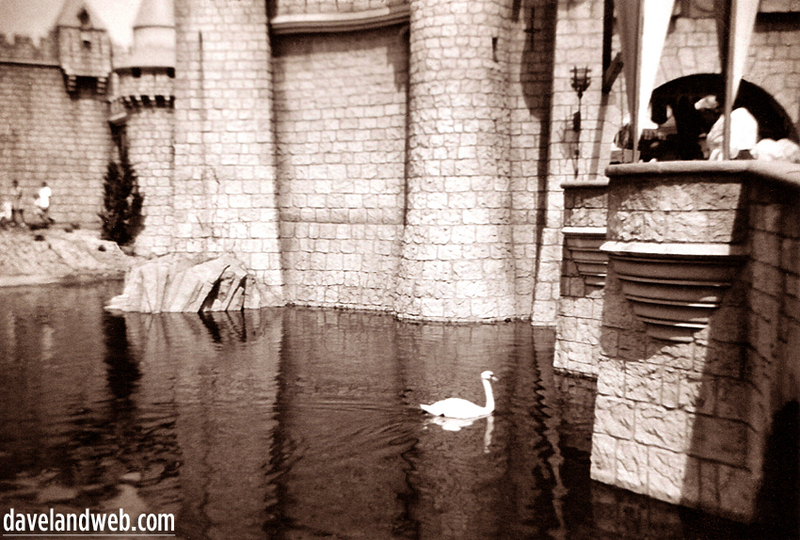 And at the end of Main Street stands Sleeping Beauty’s Castle, complete with white swans. 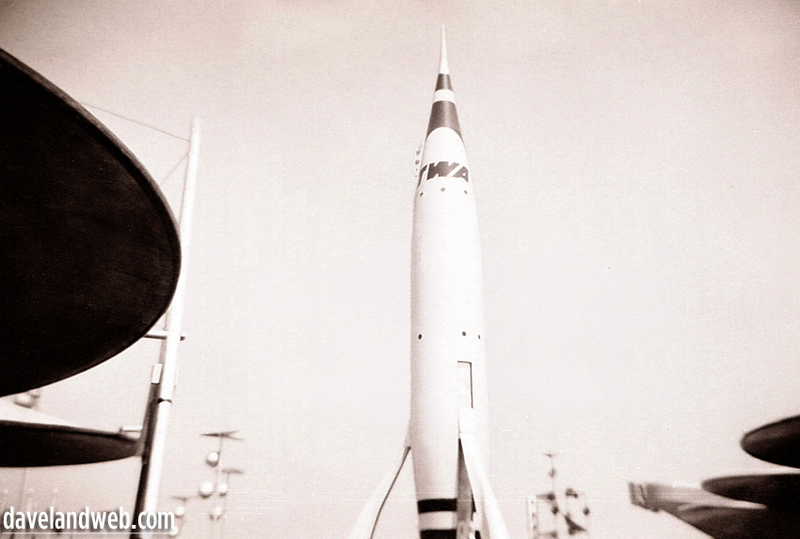 A HUUUUUUGE thanks to CoxPilot for allowing us to see photos from his personal collection! 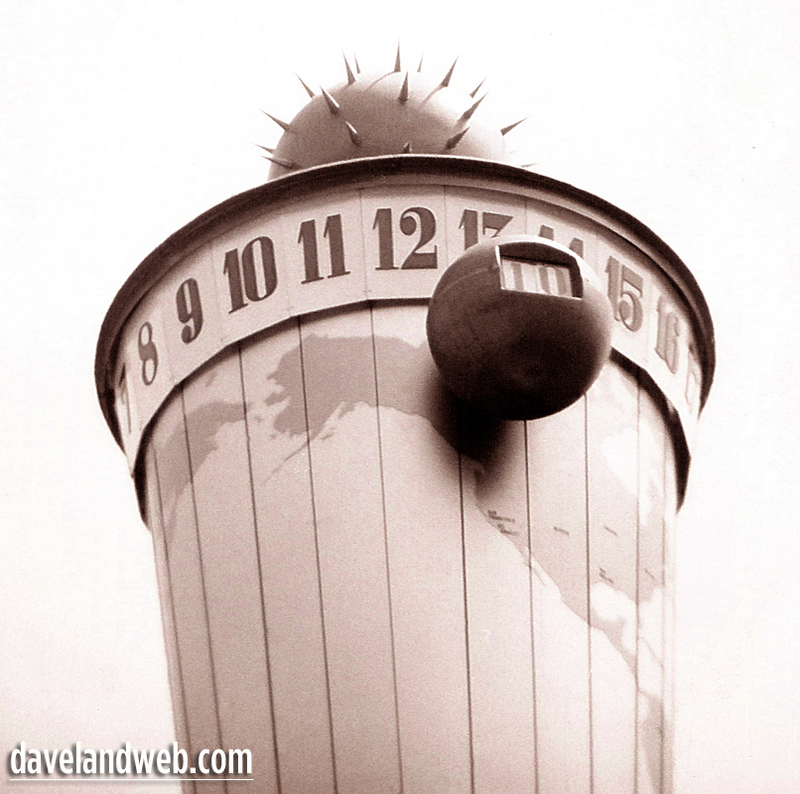 OK, I’d like to say this was planned, but I just realized when updating my site that I’d left a few off from this Tencennial batch, so here they are. 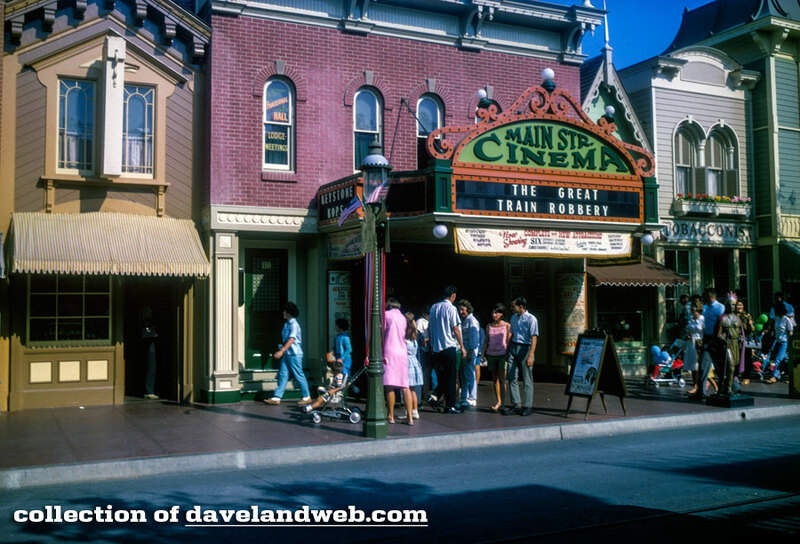 All of them show the East Side of Main Street, beginning with a nice one of the Main Street Cinema. 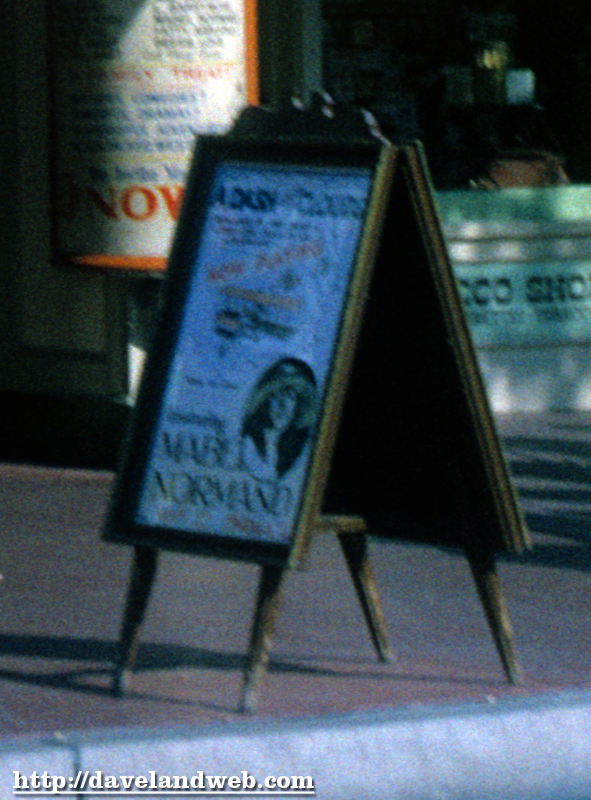 I am including a closeup of the A-Frame sign featuring Mabel Normand. 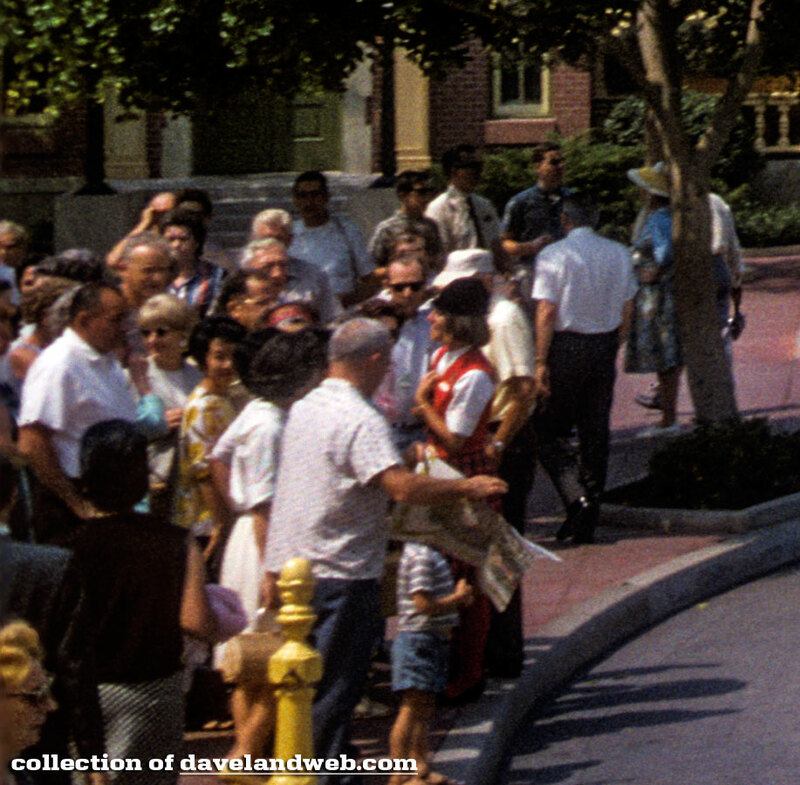 Shot 2 includes the Dapper Dans; natch I have included the closeup. 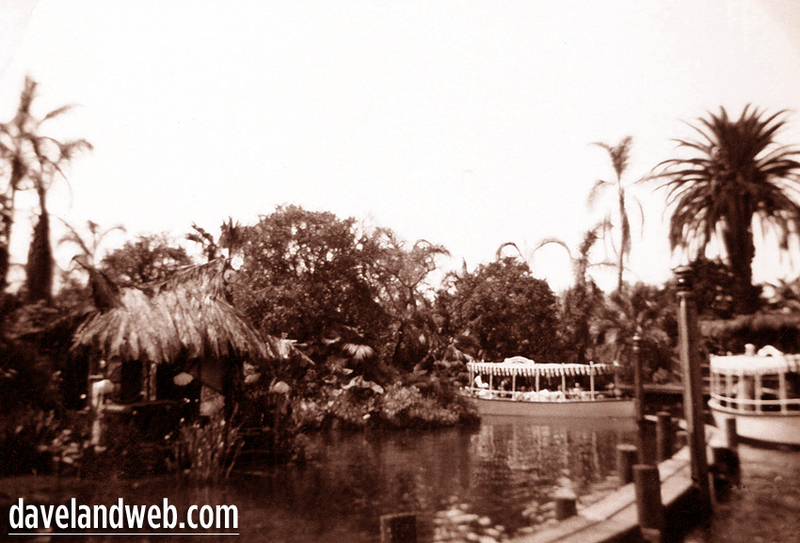 Could that be a cast member on the way to the Tahitian Terrace on the left? 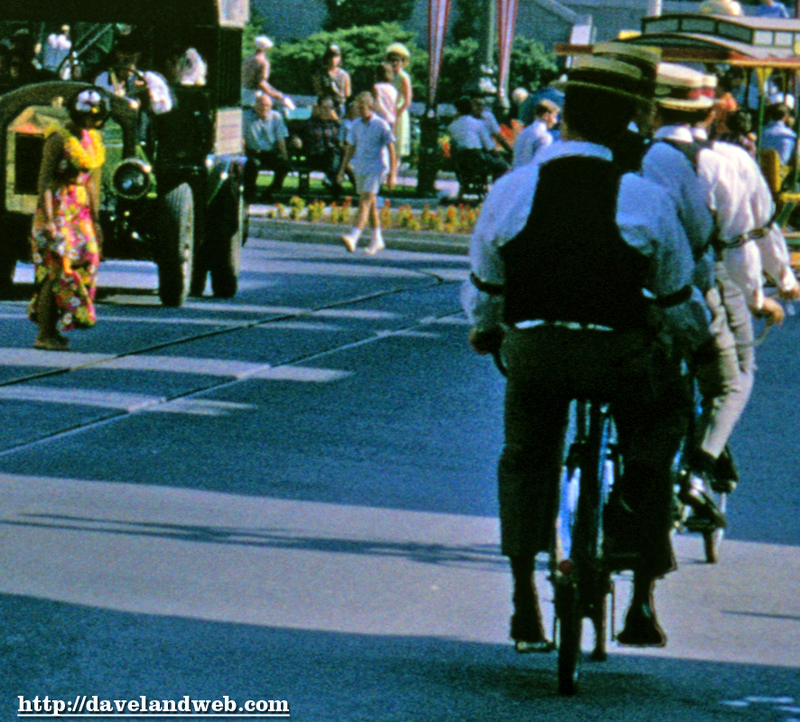 This Keystone Kop is maintaining law and order. 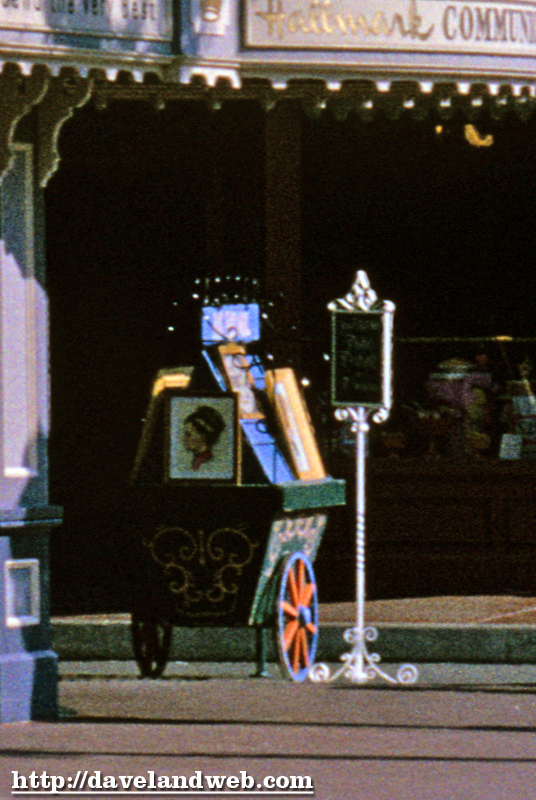 I have included a closeup of the artist’s cart on the left. 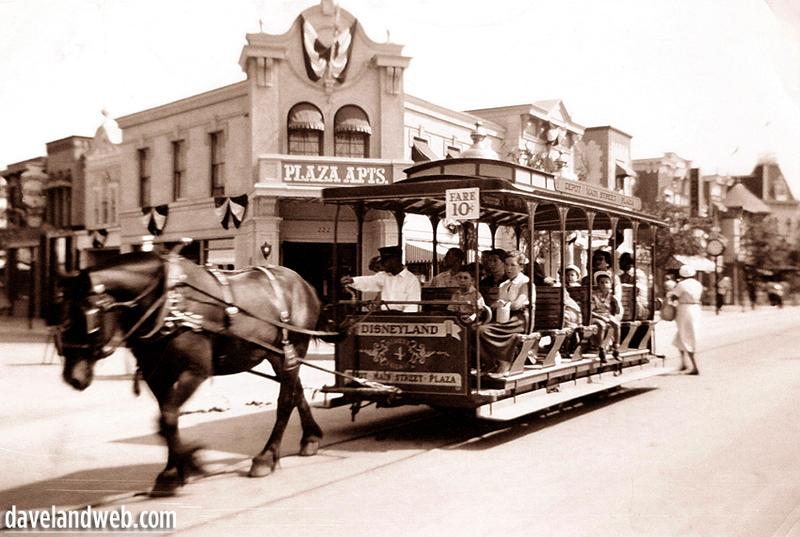 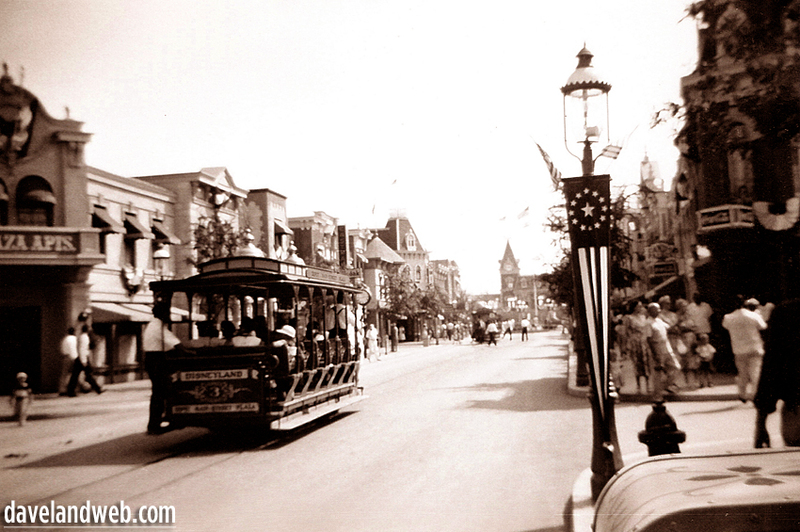 See more vintage & current Disneyland Main Street photos on my main website. 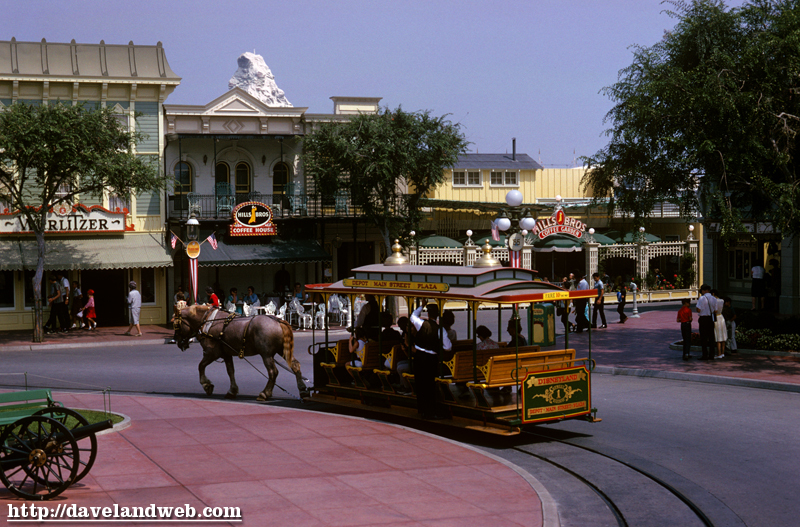 It’s the last day of the Tencennial, and the focus is Town Square. 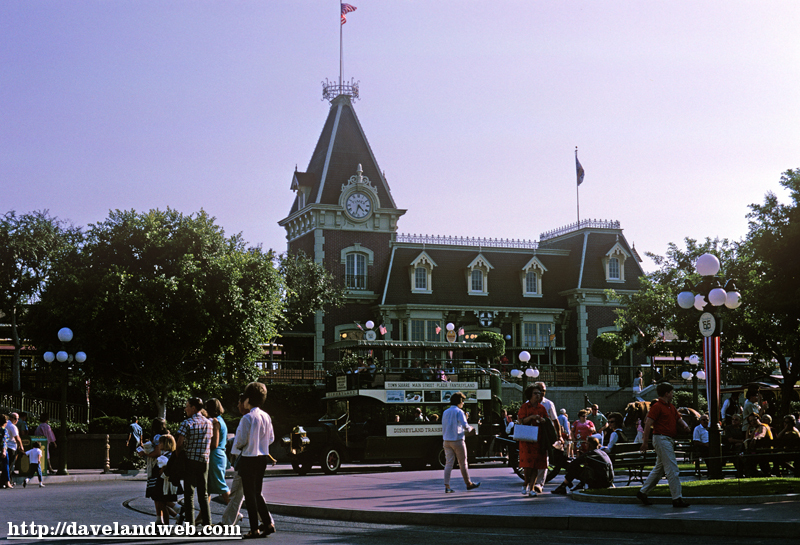 I love Town Square; it’s such a great entrance into the park. 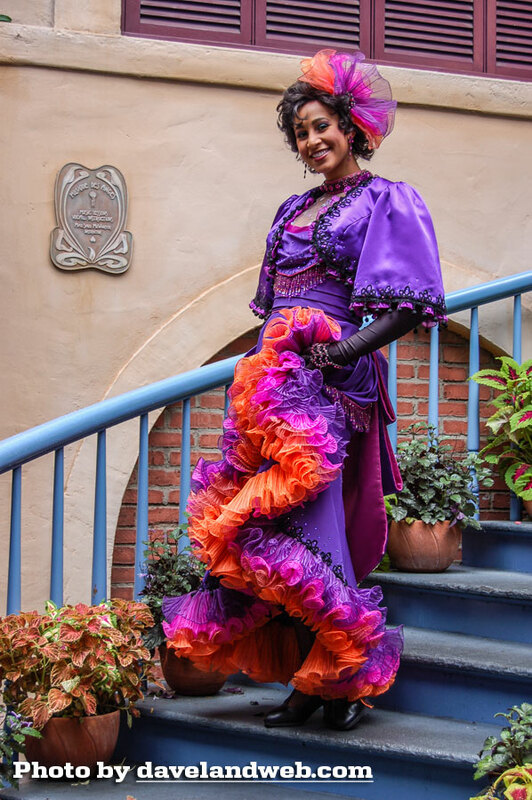 The characters are always there to welcome you, the band is often playing there, and it’s your first glimpse of the Main Street architecture that takes you back into the past. 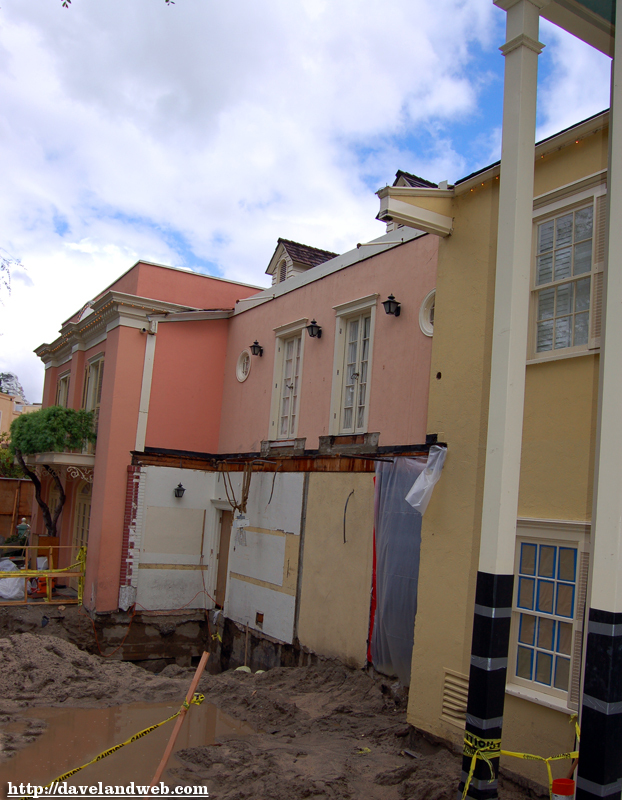 It’s also one of the saddest places when you are leaving; often I think, “Did I miss something today; should I go back?” Shot one shows the currently under-utilized area that was once the Hills Brothers Coffee House & Garden; with the lack of decent coffee at the park, you’d think this area could be put into use again for a similar concept. 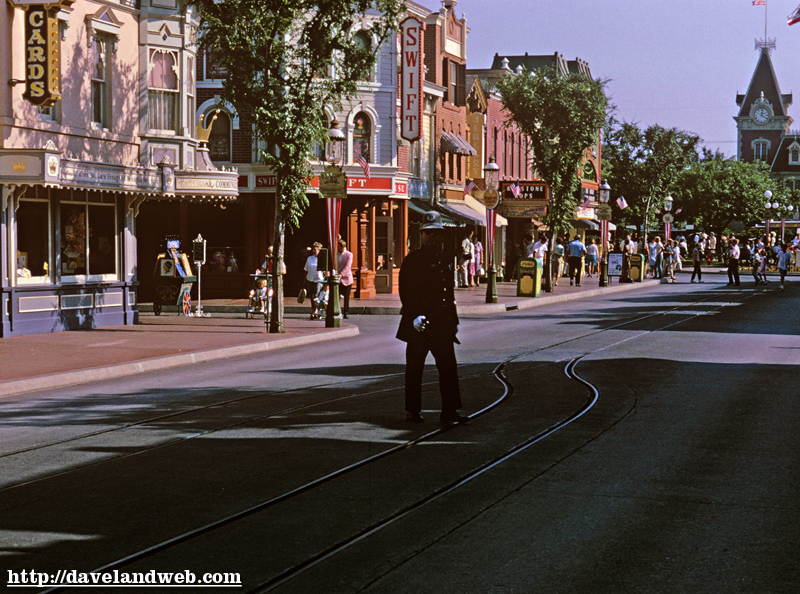 Shot 2 makes me yearn for the return of Ol’ Abe; I’m pretty much over Steve Martin’s smug hosting of the movie being shown there. 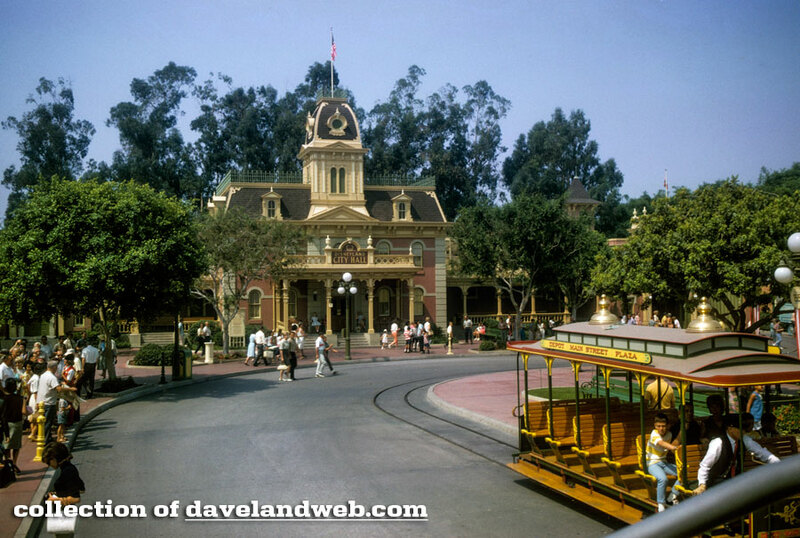 Be sure to catch the beehive on the left, and my favorite Omnibus dead center. 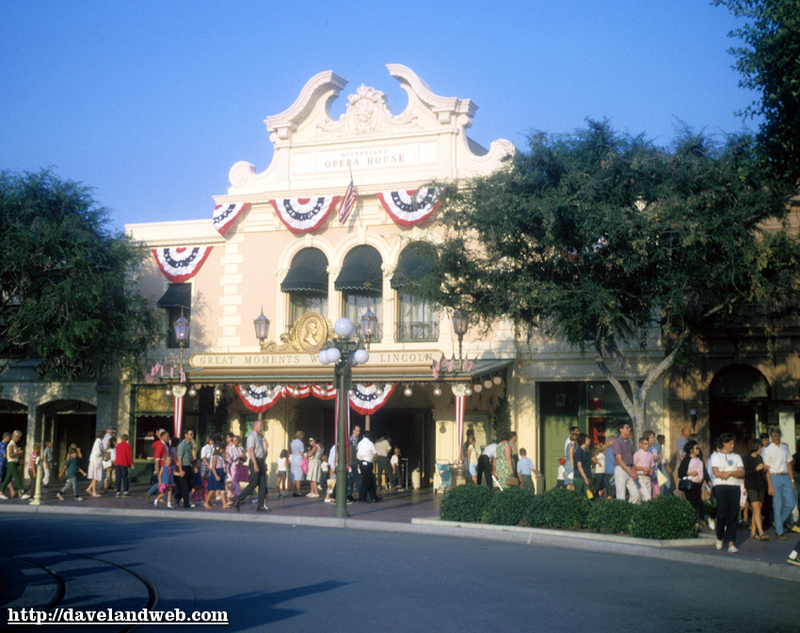 And finally, City Hall, where everyone must go on their birthday to get a birthday phone call! 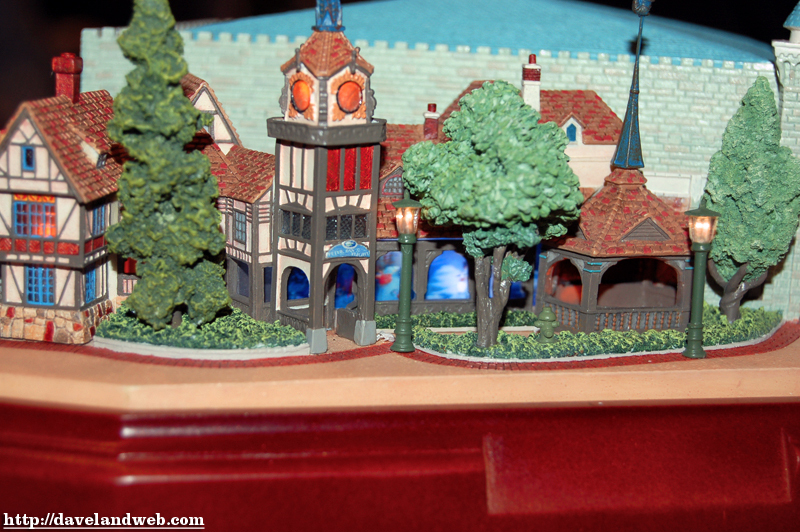 I have included another closeup of the Tencennial lamp post signage as well as one of a tour in progress. 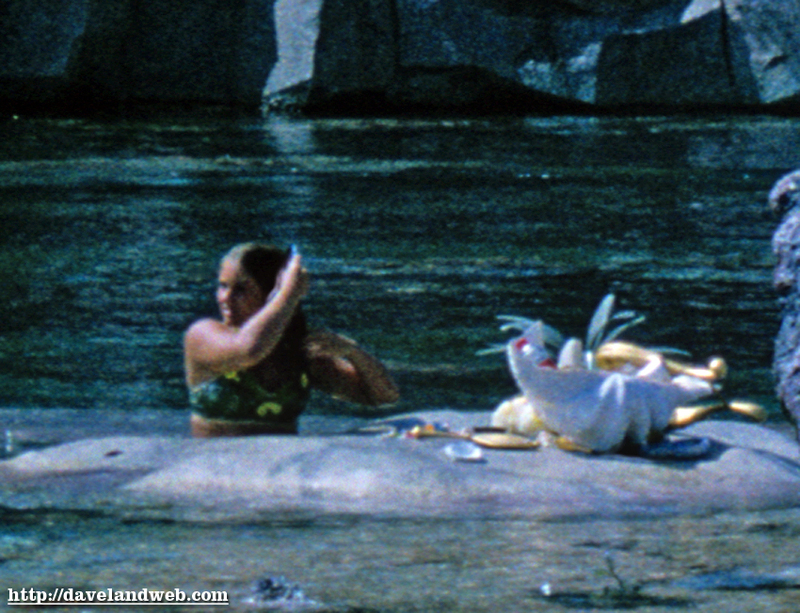 Hope you all enjoyed the Tencennial Tour, and thanks to CoxPilot for explaining our mysterious Tiki-Dressed Maiden yesterday. 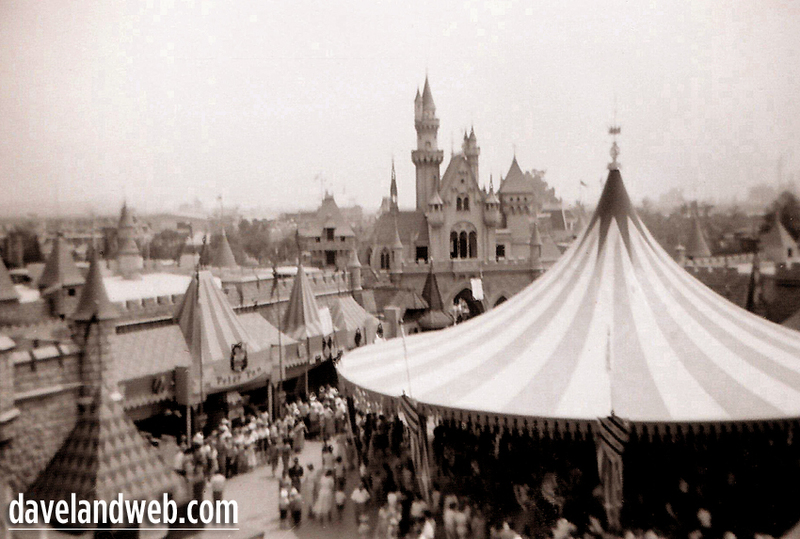 See more vintage & current Disneyland Town Square photos on my main website. 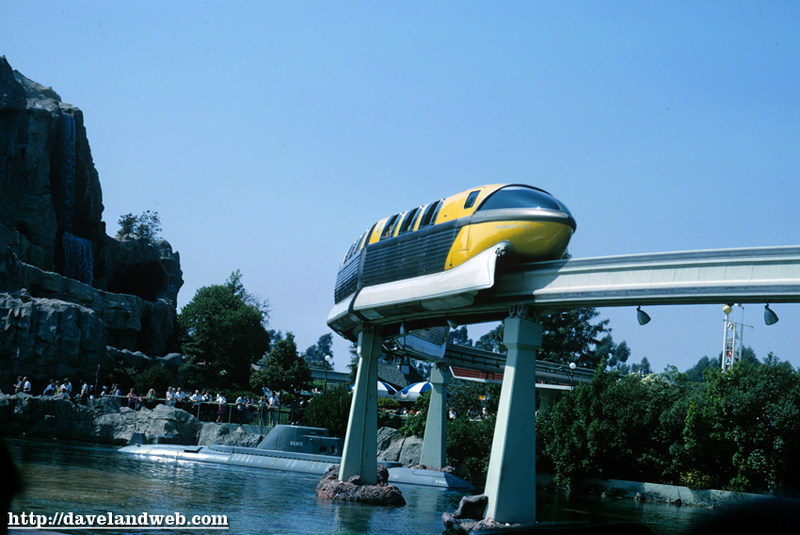 Today’s Tencennial kicks off with 3 Monorail shots—2 yellow and 1 red. 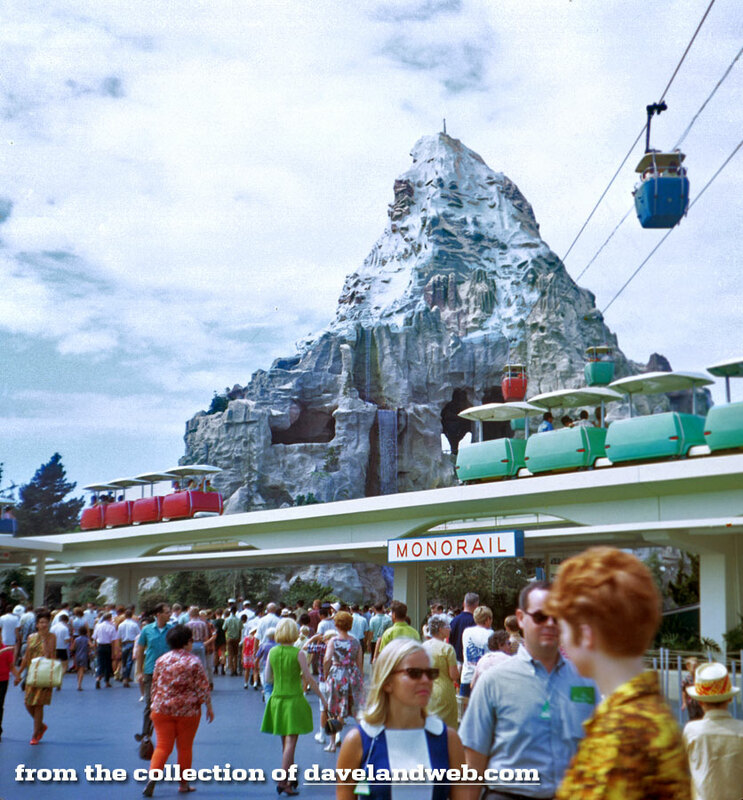 There is something about this sleek original design that is timeless; the current version just leaves a little something to be desired. 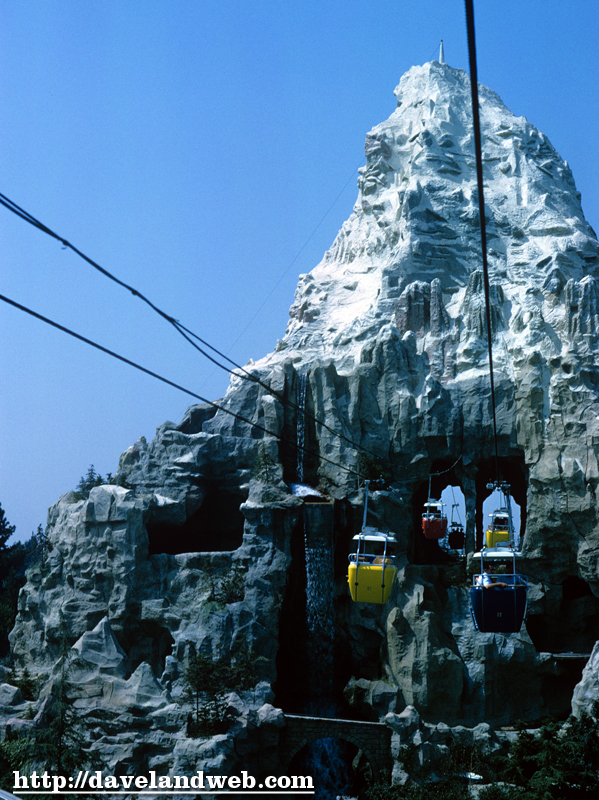 This Skyway shot shows the “new” square bucket design, as the buckets fly through the Matterhorn towards the Tomorrowland Station. 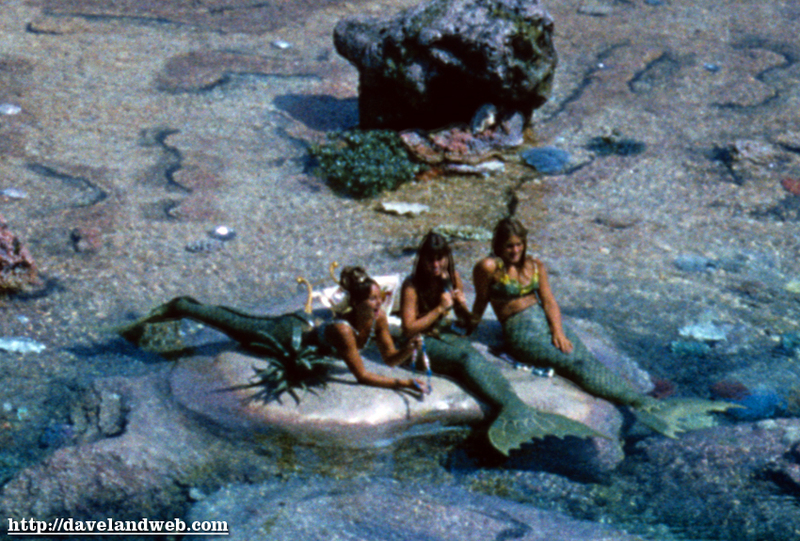 These sub shots are purty darn good too; especially for all you mermaid fans out there. 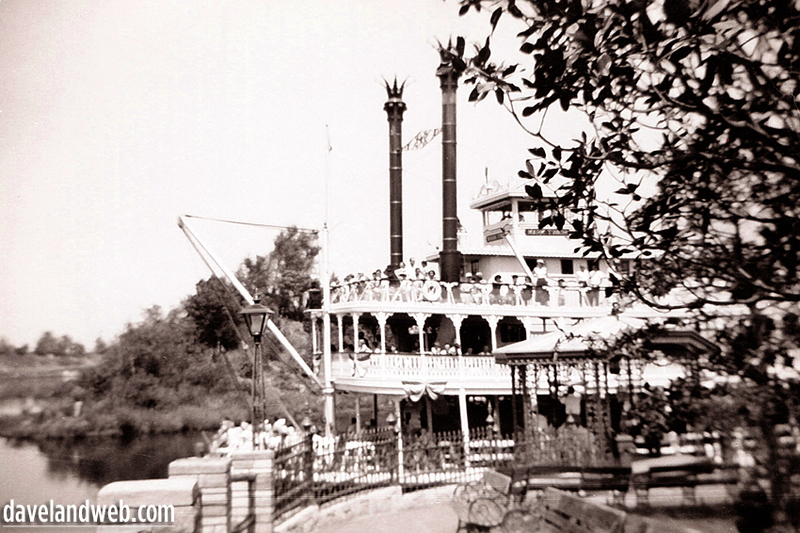 I have included closeup shots, which also show the Motor Boats in the background. 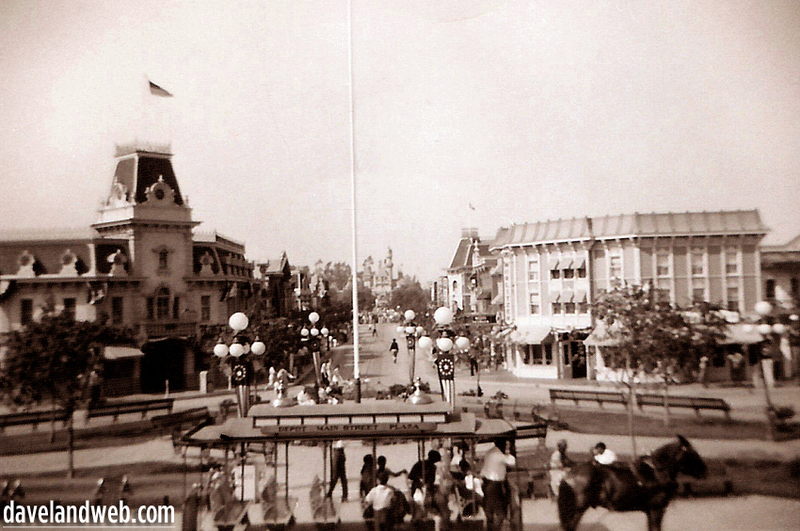 Tomorrow’s installment will be the last of this series, featuring Town Square. 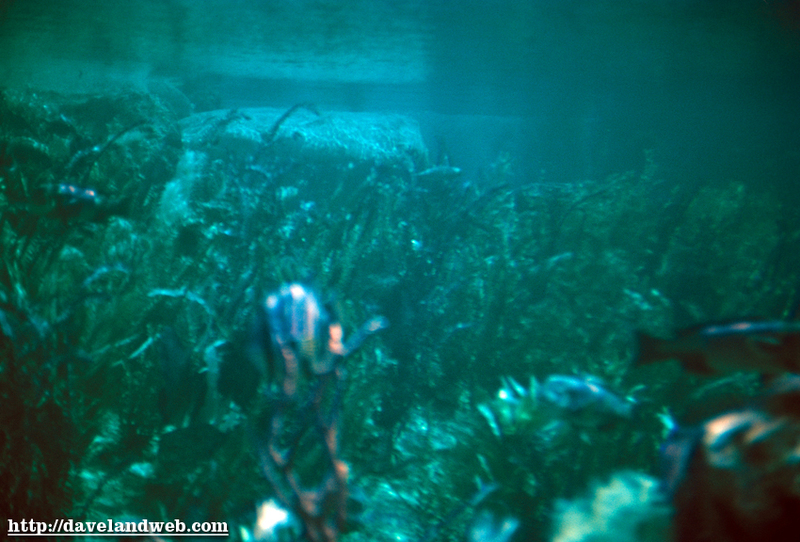 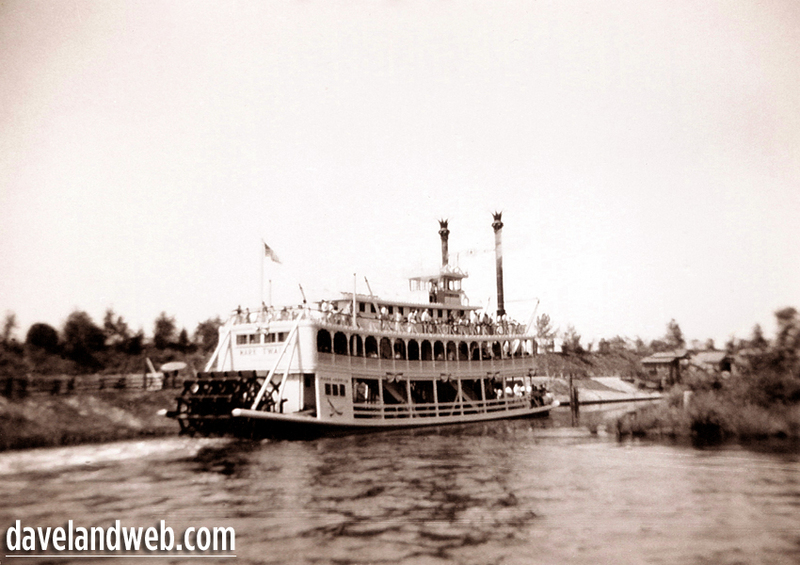 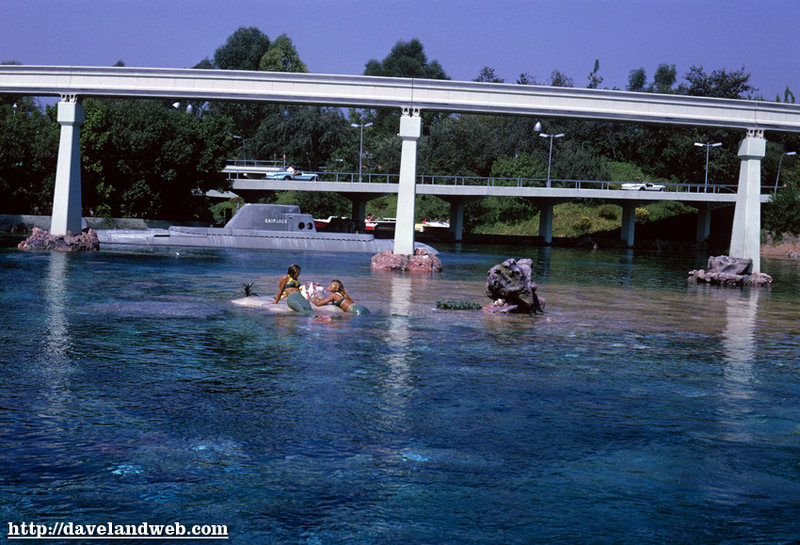 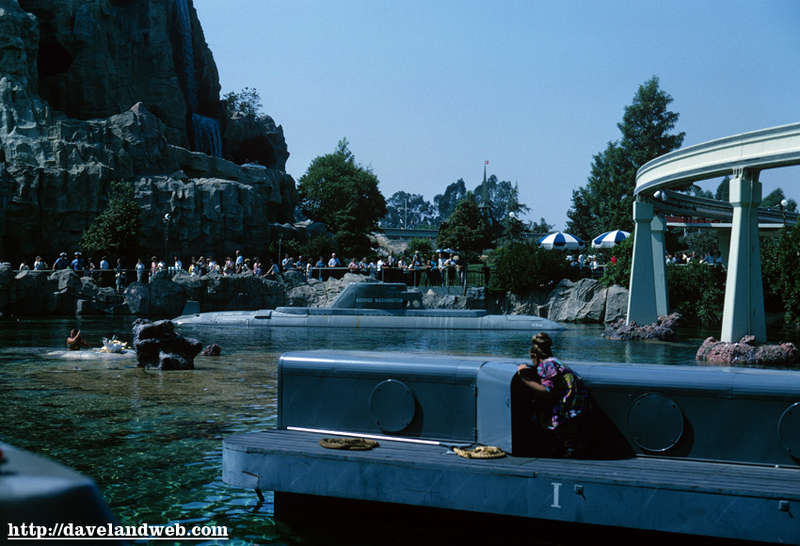 See more vintage & current Disneyland Tomorrowland photos on my main website. 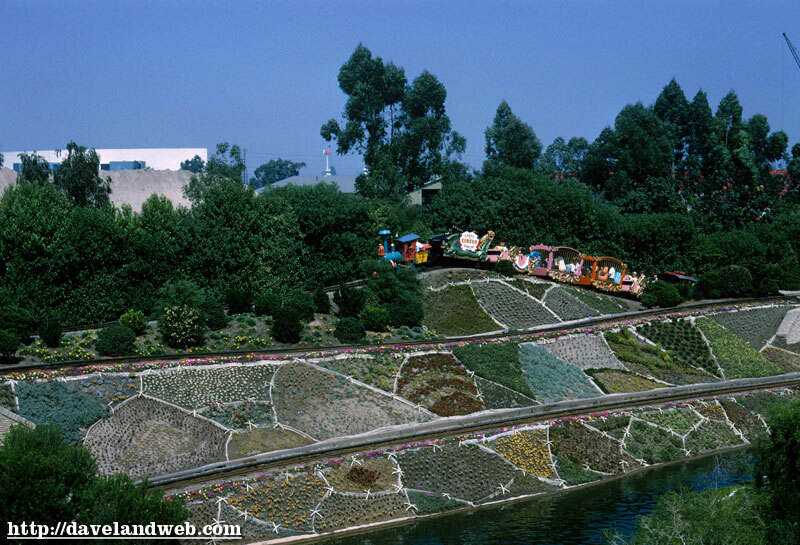 Today’s Tencennial tour includes Casey Junior and Storybook Land. 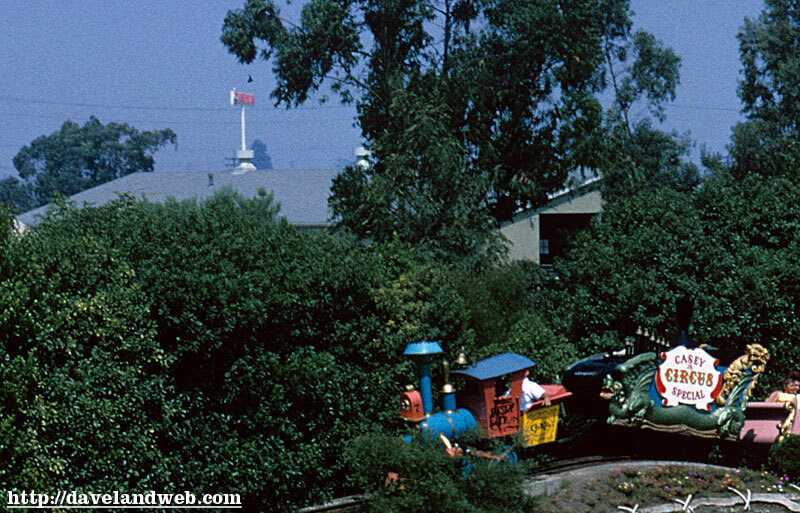 The Casey Junior train is chugging along, with life beyond the berm visible in this shot from the Skyway. 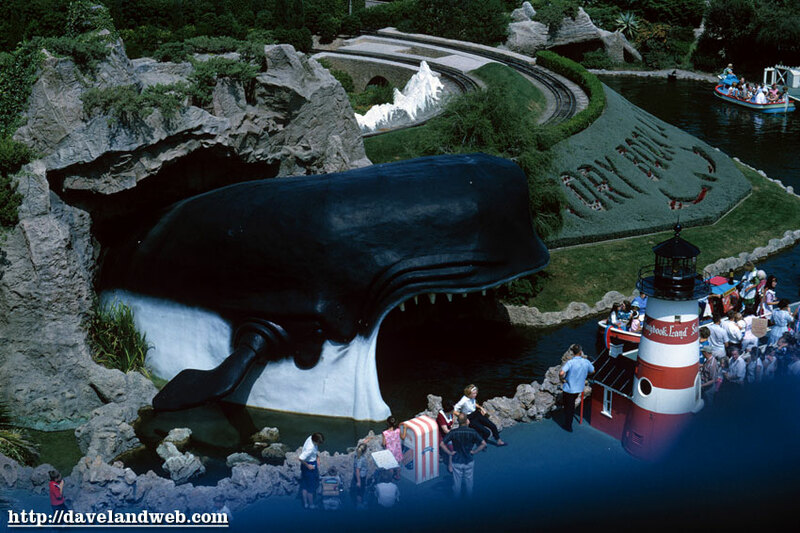 This Skyway shot shows once again that Monstro was black, not blue. 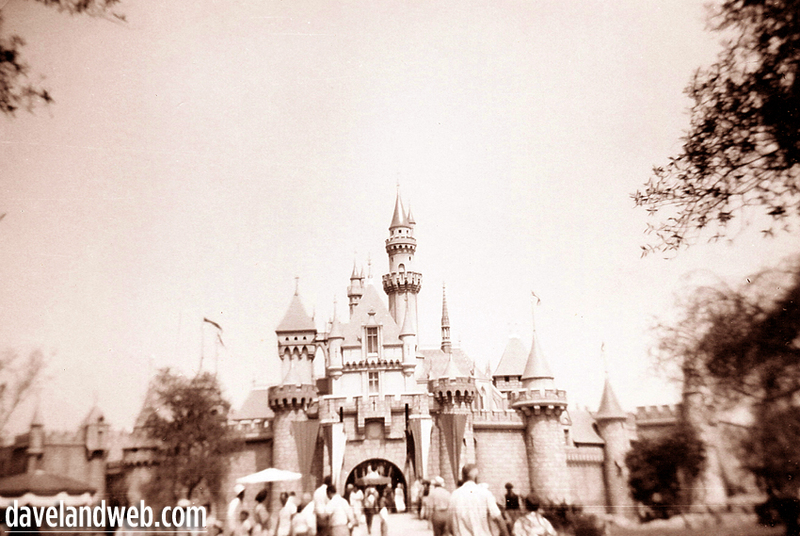 And what photo tour of Storybook Land would be complete without a shot of Cinderella’s Castle? 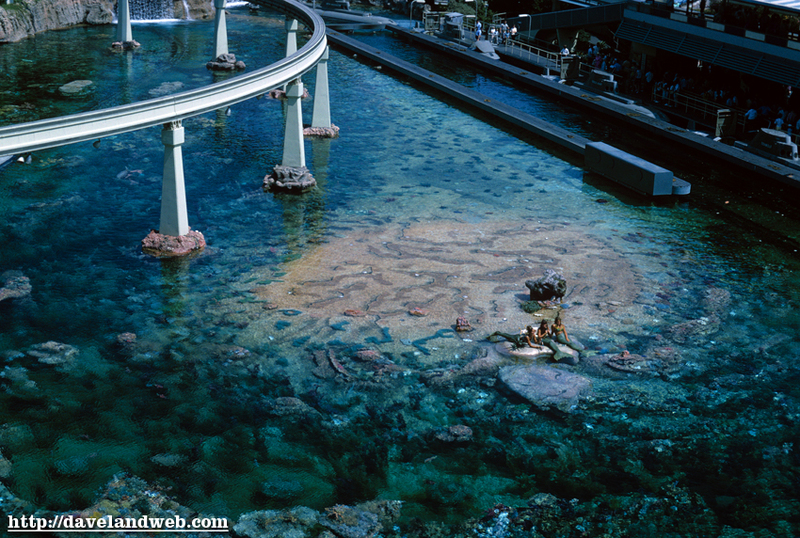 Certainly not this one! 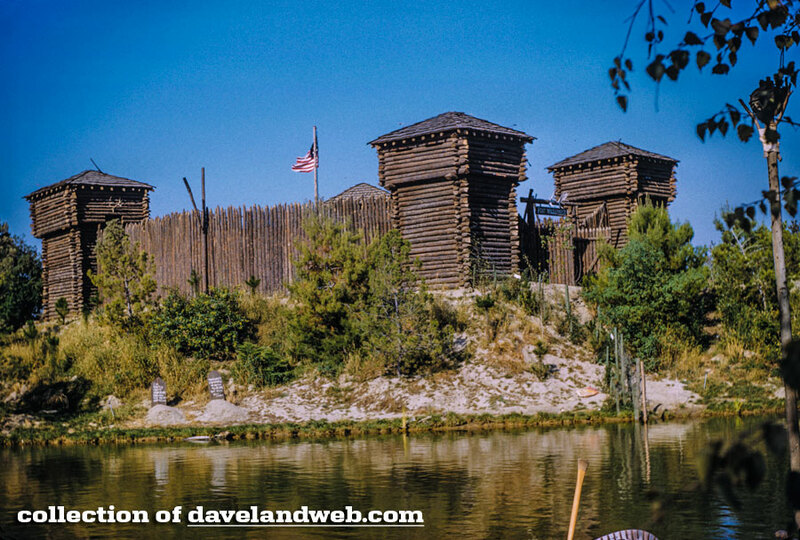 Tencennial: Go West Young Man!